My friend Glenn and I recently returned from a trip to Amsterdam, Paris and Venice. I first went to Amsterdam and Paris on a school trip when I was 14. The trip cost $750 and I paid for it myself with my summer-job money. It was one of the best decisions I've ever made and I'll never forget it. Is there a place you've always wanted to visit? Go there! There's nothing like traveling. It's the best gift you can give yourself and the memories will last forever. 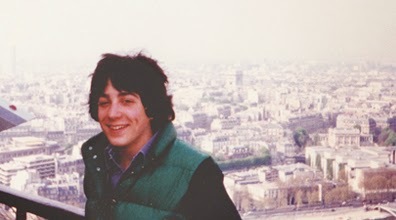 Here I am in Paris on the Eiffel Tower in 1980. The Grand Canal in Venice viewed from the Rialto Bridge. When in Amsterdam, hop on a bike and join the locals.